AH. Francke termed Ladakh as western Tibet. In 1905 he collected 89 inscriptions, compiled then under the title ‘First Collection of Tibet Historical Inscriptions on Rock and Stone from West Tibet.’ I got this manuscript in 1983 and thought to do further research on it. Francke written preface and dated the inscriptions in German language. Therefore, till 2000, I was unable to translate the German portion in English. However, with the German Embassy’s kind co—operation the translation work was done in the end of 2000. This year when my publisher Sri Satguru publication was ready to publish the same, I decided to complete this work. I made Five chapters viz. Tibetan Text in classical Language, Text in Roman Transliteration, Possible correct form of the Tibetan Inscriptions, Translation of the Tibetan Text and Notes and References in order to give a shape of book. Since the manuscript was very old and was even difficult to understand the collected inscriptions, Francke also admitted this. I feel these inscriptions have historical importance, therefore, I made all possible efforts to translate them correctly. Francke endeavoured to arrange the inscriptions in a systematic order since 800 A.D. to 1902. Thus this manuscript now a historical document of scientific study. Which reflects the complete history of Ladakh kings regime. The present book has many inscriptions related with Buddhism and in the interest of Ladakh history I do not feel to explain them is details. However, historical facts being considered. I prefer to give the name of this book ‘First Collection of Tibetan Historical Inscriptions on Rock and Stone from Ladakh Himalaya. I hope this work will be useful for teachers & students who are interested on Ladakh studies. Dr. Prem Singh Jina did his Ph.D. from Postgraduate Department of Economics, Kumaun University, Nainital. He has also done short term courses in Animal Husbandry, Agronomy, Horticulture, and Mush- room Production from G.B. Pant University of Agriculture and Technology, Pantnagar. Dr. Jina started his professional career in the Central Institute of Buddhist Studies, Leh, Ladakh in 1981 as a Lecturer in Economics. He has written five books on Ladakh Himalaya entitled ‘Tourism in Ladakh Himalaya’, ‘High Pasturelands of Ladakh Himalaya`. ‘Famous Western Explorers to Ladakh’, ‘Phyang monastery of Ladakh’ and ‘Ladakh: 'The Land and the People’. Besides. he edited one book ‘Recent Researches on the Himalaya of Himalaya' and has written more than fifty research papers on different aspects of Ladakh Himalaya. He has presented 12 papers in the International Conferences and 20 papers in the National Conferences. His more than 40 radio talks on different aspects of Ladakh have been broadcasted from Leh radio station. His radio feature on ‘Hemis Gonpa’ was chosen for National Hook—up and his another feature on ‘Ladakh Saj’ was chosen for J&K State Hook-up radio programme. He is at present attached with Central Institute of Buddhist Studies, Leh-Ladakh and is actively doing his research work on Ladakh Himalaya. Kashmir Takri; Arabian- Urdu; and several still undefined ones. The collection cannot claim to be of scientific value since it has been assembled to a larger part by natives. Although I drew the people’s attention to the importance of the division of lines in the originals, the same has almost nowhere been observed. However, I have to state as an apology on behalf of the scribes that the lines on the originals were often of such length that the paper put at heir disposal was not often not large enough. As the correct reading of badly preserved passages the natives have often outdone me. The collection shall pave the way for the future scientific treatment of these documents which are so important for the historical exploration of the country. If some of the older inscriptions have been rendered incomplete, this is due to their bad state of preservation. More recent inscriptions appear often as fragments for that reason only because the time did not permit to copy them completely. Almost all originals are characterized by wrong and inconsequent spelling. That l do not wait with the publication until I have personally convinced myself on the spot of the correctness of all the copies, is due to the fact that l have hardly any prospect of looking up the many places represented by inscriptions in the course of several years. I myself have seen the following: Nos. 1-5, 11-38, 42, 52, 55, 59, 61, 64, 66, 68- 70, 74-76, 79-82, 84, 37, 83. No. I was copied by Reverend Gustafson, Shigar, Baltistan and No. 86 by Dr, EE. Shawe, Leh. AH. Francke termed Ladakh as western Tibet. 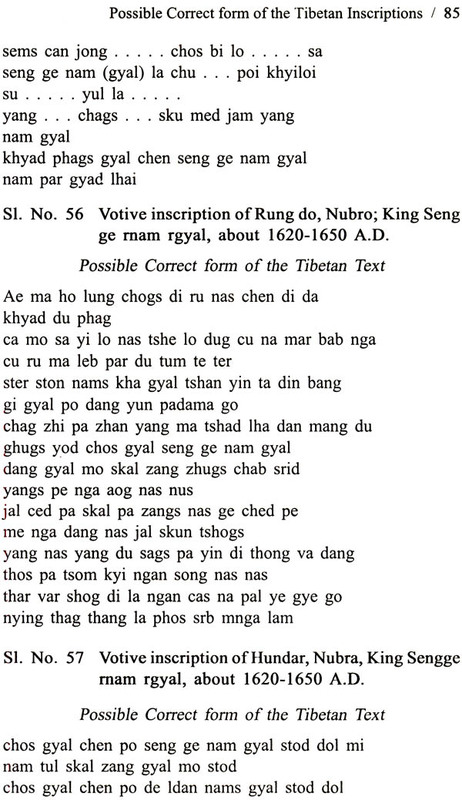 In 1905 he collected 89 inscriptions, compiled then under the title ‘First Collection of Tibet Historical Inscriptions on Rock and Stone from West Tibet} I got this manuscripts in 1983 and thought to do further research on it. Francke written preface and dated the inscriptions in German language. Therefore, till 2000, I was unable to translate the German portion in English. However, with the German Embassy’s kind co-operation the translation work was done in the end of 2000. This year when my publisher Sri Satguru publication was ready to publish the same, I decided to complete this work. I made Five chapters viz. 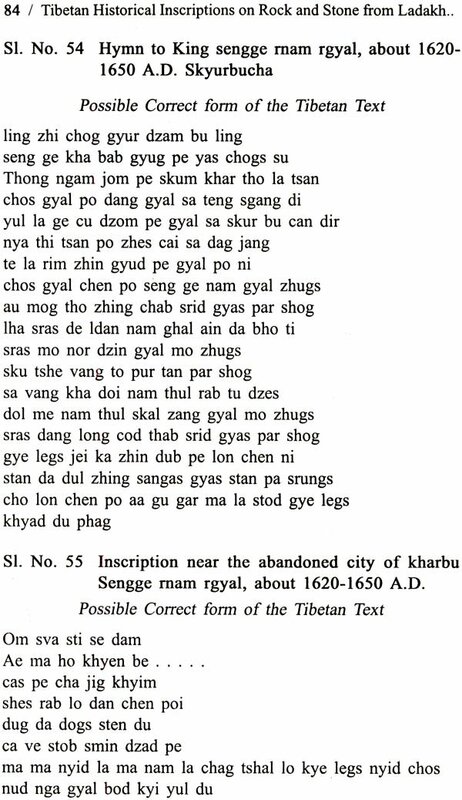 Tibetan Text in classical Language, Text in Roman Transliteration, Possible correct form of the Tibetan Inscriptions, Translation of the Tibetan Text and Notes and References in order to give a shape of book. Since the manuscript was very old and was even difficult to understand the collected inscriptions, Francke also admitted this. I feel these inscriptions have historical importance; therefore, I made all possible efforts to translate them correctly. Francke endeavoured to arrange the inscriptions in a systematic order since 800 A.D. to 1902. Thus this manuscript now a historical document of scientific study. Which reflects the complete history of Ladakh kings regime. I would like to express deep appreciation to Prof. Maya Ram Rtd. Director (Higher Education U.P. ), the librarian of Leh district Sri Tundup Yamphel and Indrabhanu Panda for giving me moral support. I express my thanks to Mrs Manu Jina, Principal, Hira Convent School, Bari Mukhani, Haldwani and Ex. Hony. Capt. Tsewang Norbu (Taru), who always inspired me to write on Ladakh. I am greatful to all others who had associated with me, especially for those whose references I have included while explaining the historical facts. Lustre Press & Roli Books.